I'm exhausted from Rent the Runway Sample Sale and three events tonight but I just had to post a quick re-cap. This sale is phenomenal - when I read up to 95% off retail, I knew it was going to be a good one. The racks are all split up by size and most dresses are around $85-$125. There are dresses from all my favorite designers - BCBGMAXAZRIA, Herve Leger, Missoni, Tibi, Lela Rose, Preen, Badgley Mischka, Brian Reyes, Bibhu Mohapatra, Catherine Malandrino, Theory, Pencey, Vena Cava, Z Spoke Zac Posen, Helmut Lang to name a few. I was amazed at how many size 0 racks there were. I was amazed at the designer bargains I got, and couldn't believe the pricing, until it was all confirmed at the register. I got a Halston Heritage ruched melange dress for $25 (originally $350)! It doesn't get any better than that! I also got a Tracy Reese wrapped sheath for $45 (originally $300) and a silk Rebecca Taylor raspberry layer cake dress for $49 (originally $325). 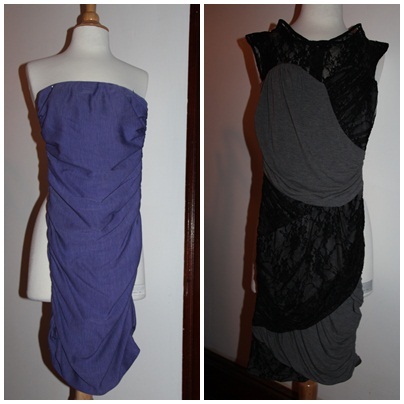 Here are two of the dresses I got at the sample sale. My dress form is not a size 00, so I had to pin these dresses on. I was told that there will be no restocking, and some price slashing may go into effect as the sale winds down on March 4th (if there is anything even left by then). I am definitely going back during my lunch break. I didn't even make my way over to the gowns yet, and we are talking $800 gowns for $100. There is a community fitting room with plenty of mirrors, and I was lucky enough to not have to stand in line. As I left the fitting room at 5:30, the line was piling up. Gather as many items as you can to try on. You don't want to have to go back and wait in a long line all over again. Be sure to eye the clothes other people have in the fitting room. You might want to try on something they don't plan on buying. Make sure you are wearing something easy and comfortable to change in and out of. If you are unsure about a dress you are trying on, don't be afraid to ask for someone's opinion. Don't forget to bring a credit card. Only credit accepted. No cash. 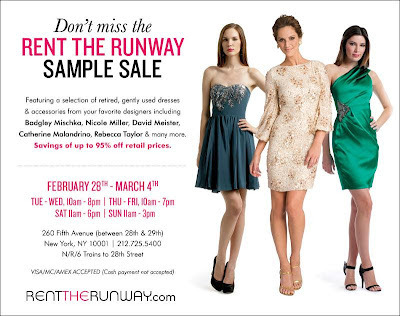 Here's info on the sample sale again in case you want to drop by (highly recommend it)! I am so jealous of you!!!! I wish I could be there...this is such an amazing sale. I went back for a second and third time, which by then was 40% off! The last day was 50% off but I didn't need to go back. I got 7 dresses total!